Again, she wasn't drunk. She clearly had some sense of decorum or modesty, since she was rebuffing the more demonstrative of Tommy's advances only moments before. Why would she suddenly allow Tommy to go much farther, outdoors? Being outdoors was unnecessary. Why go outdoors? Not only did being outdoors, at that point, not make it any less likely they would be discovered, arguably, it made it more likely. Maybe, Martha went outside because she was trying to go home. Maybe, she went outside because she had not consented to a sexual encounter. Maybe, she went outside because, now that everyone was gone, Tommy was coming on too strong. Maybe, Martha Moxley went outdoors because she was afraid. In the upcoming interview, Tommy may explain the situation this way: Alright, she still wasn't warming up to the idea of hooking up when I asked her to wait while I spoke to Andrea. In fact, we hadn't even discussed it. It was up in the air--unspoken. After I started to walk her home, that's when she finally reciprocated my advances. In the heat of the moment, we found ourselves getting hot and heavy right there. Only afterwards, did we realize how cold it was, or the craziness of where we were laying. Passion took over. Let it not be denied that passion and hormones of teenagers are powerful forces--capable even, of occasionally fighting back the elements. So, let's accept this version of events for a moment. Tommy is walking Martha home, still trying to woo her. Flirting, kissing, playing around...boom, she is now swept off her feet. The [WW] have their encounter and, for whatever reason, it's all over within twenty minutes. If we accept this version, the following questions have to be answered. First, Tommy reported that at approximately 9:30, while at the side (kitchen) door, he had a brief conversation with Martha Moxley who was in the driveway. He tells Martha to wait inside the side door for him. Then, he enters the house. However, a number of eyewitnesses claim they saw Martha walk around the back and not go directly inside. 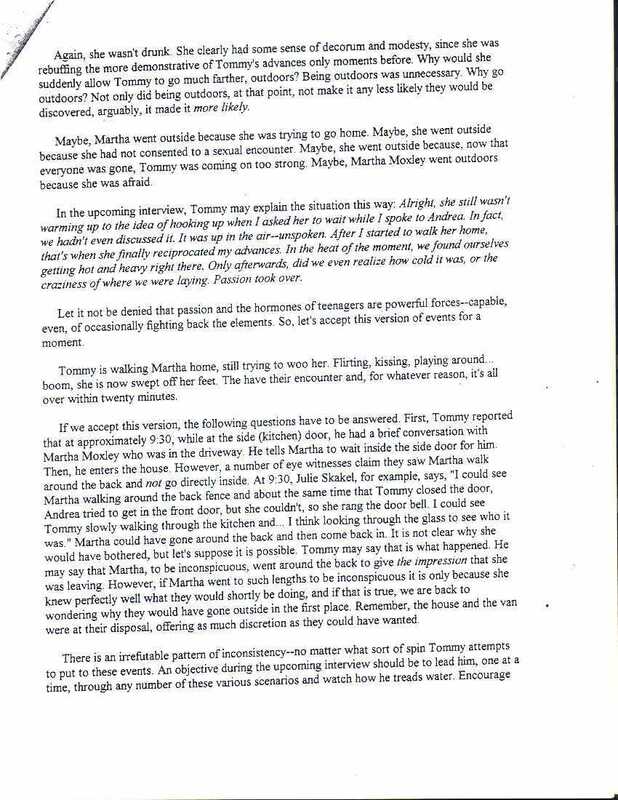 At 9:30, Julie Skakel, for example, says, "I could see Martha walking around the back fence and, about the same time that Tommy closed the door, Andrea tried to get in the front door, but she couldn't, so she ran the door bell. I could see Tommy slowly walking through the kitchen and ... I think looking through the glass to see who it was." Martha could have gone around the back and then come back in. It is not clear why she would have bothered, but let's suppose it is possible. Tommy may say that is what happened. He may say that Martha, to be inconspicuous, went around back to give the impression that she was leaving. However, if Martha went to such lengths to be inconspicuous it is only because she knew perfectly well what they would shortly be doing, and if that is true, we are back to wondering why they would have gone outside in the first place. Remember, the house and the van were at their disposal, offering as much discretion as they could have wanted.